October | 2012 | YesBiscuit! 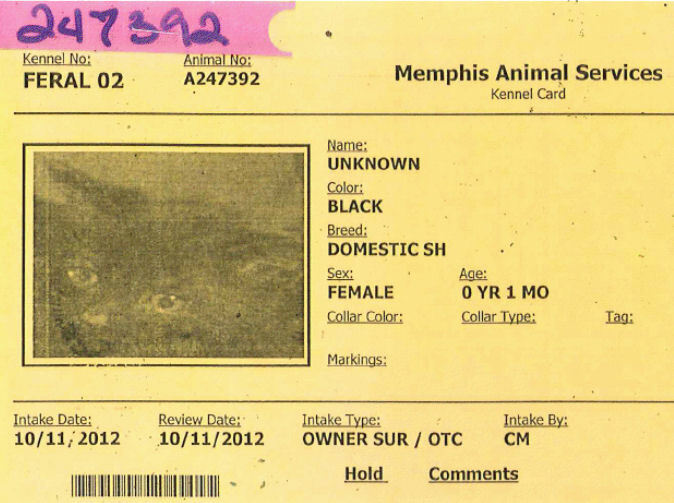 Readers may remember Nola, Victoria Henry’s dog who was picked up by Memphis Animal Services and killed before the legally mandated holding period expired, even while Ms. Henry visited the pound looking for her. Tragically, MAS has done it again – this time the victim is a beloved dog named Oliver. Oliver and his buddy Marlene escaped owner Tish Tonole’s yard on October 13. She began trying to get them home right away by posting notices on social media sites, putting up fliers around town and visiting MAS to look for her dogs. Oliver was wearing his collar and Marlene was microchipped. Ms. Tonole says someone who saw Marlene running loose responded to one of her fliers and she was able to pick Marlene up. But 11 month old Oliver remained missing. Ms. Tonole visited MAS to search for Oliver multiple times, including October 18. The worker who escorted her through the facility that day said that she was being shown every dog cage in the building, including dogs being held for court cases. But Ms. Tonole told me she only saw roughly 100 cages and half of them were empty. We know MAS has 555 cages in the facility (128 for cats and 427 for dogs) so clearly she was not shown every dog cage. The worker also advised her that it wasn’t necessary for her to come to the shelter every day to search for her pet. He told her about the PetHarbor website saying it was continually updated and that if Oliver was impounded, he would immediately appear on PetHarbor. Ms. Tonole began frequently checking PetHarbor and on Saturday, October 20, a listing for Oliver appeared on the site. It said that Oliver had been at MAS since the 17th which was troubling since Ms. Tonole had been there on the 18th and did not see him. MAS was closed by the time she saw Oliver on the website and remained closed for the next 2 days. She kept trying to reach someone on the phone but only got a recording. Oliver as pictured on PetHarbor. Ms. Tonole describes him in this photo as looking like he wants to play with the person taking his picture. Finally on the morning of Tuesday the 23rd, Ms. Tonole got a female employee on the phone before the pound officially opened. The employee told Ms. Tonole that Oliver had been killed on October 18, just one day after impound, because he had a hole in his head. Understandably, Ms. Tonole became upset and told the worker that Oliver could not have had a hole in his head because MAS posted a photo of him on PetHarbor which showed him to be his usual happy and healthy self. The worker restated that records indicated Oliver had been killed on October 18 due to a hole in his head. Ms. Tonole hung up the phone and was very distraught when a friend happened to call her. She told the friend what had just happened and the friend said he would call MAS to try to sort things out. Ms. Tonole says that her friend spoke to James Rogers who told him that Oliver had just been killed that morning due to a hole in the head. The friend asked if they could see Oliver’s body and Mr. Rogers refused. Later, Ms. Tonole says MAS changed its story about the reason Oliver was killed from a hole in the head to a hole in the stifle. Memphis Animal Services sent a statement offering condolences to Tish Tonole over the loss of Oliver. The statement says Oliver was scanned for a micro chip but did not have one. They said Oliver was visible to the public for four days. The shelter stressed the importance of getting your pet micro chipped. Ms. Tonole is a single mom who works, attends school and must budget her expenses carefully. She didn’t have Oliver microchipped but she did have Marlene chipped due to her tendency to escape. In fact, Marlene had escaped just a few weeks prior to Oliver’s killing and Ms. Tonole had visited MAS looking for her. Although she wasn’t shown Marlene at that time, Marlene was in fact there. A local pet advocate recognized Marlene’s picture on PetHarbor and responded to a lost dog posting from Ms. Tonole. MAS had never contacted Ms. Tonole despite Marlene’s microchip and the only way Marlene got home that time was due to the watchful eye of a local advocate. Further, MAS states that Oliver was visible to the public for four days yet glaringly omits the fact that the owner was at the pound on one of them, supposedly being shown every dog in the place, but never finding him. The statement also fails to mention that Oliver was not posted on PetHarbor, where the MAS employee told the owner to look, until Saturday – after which the pound is routinely closed for 2 days every week. Let’s be clear: It is not the owner’s fault that Oliver is dead. The blame for that lies squarely with MAS. The subsequent lies, spin and attempted cover-up are par for the course in Memphis. Oliver is yet another casualty in the ongoing tragedy that is MAS. They can try to say they showed the owner every cage in the building but obviously that is not true. They can try to say the owner could have saved Oliver by having him microchipped but obviously that is not true either. No one at MAS is willing to do their job. No one in a position of authority is willing to hold them accountable. No one local is willing to take legal action to force them to stop hurting animals. And so the killings continue. How many more Memphis? Every pet has a right to live. Just because MAS refuses to acknowledge that doesn’t make it any less true. The people at MAS don’t know what precious gifts they have been given the privilege of caring for. They don’t know that pets are family and animal services=family services. And they don’t know Oliver. I’m sorry that no one at MAS could be bothered to do their job and shelter Oliver in his time of need. I’m sorry that when they were caught killing a pet whose owner was in their facility trying to find him they resorted to lies. I’m sorry that in their efforts to deflect attention from their own failures they attempted to shame Ms. Tonole. 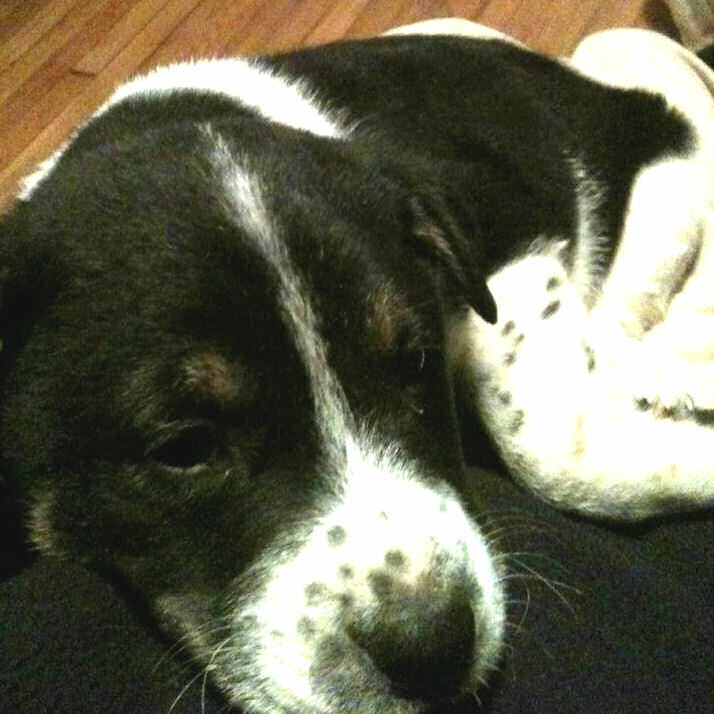 Most of all, I’m sorry that this silly puppy who brought such joy to his owner has been cruelly taken from this life. Longtime readers might recall pet advocate Barbara Koblinksy’s efforts to save pets from a cruel rabies policy in Putnam Co, WV. The fight cost Ms. Koblinsky her county job, twice. Both times she went to court and won. Hurray for free speech and thank you for keeping up the fight Ms. Koblinksy. The VA Beach Animal Care and Adoption Center has added a full time behavior consultant in an effort to help make the animals more adoptable. The religious ritual killing of fully conscious food animals by Jews and Muslims may be regulated in the Netherlands. NYT has a video visit with photographer William Wegman and his Weims at home in Maine. A child’s letter, 1956: Dear Frank Lloyd Wright, My dog “is two and a half feet high and three feet long.” Would you design him a dog house? Right. Because killing pets is the one and only plan that could ever exist in any realm of possibility. Never mind the fact that there are dozens of open admission no kill shelters all over the country. 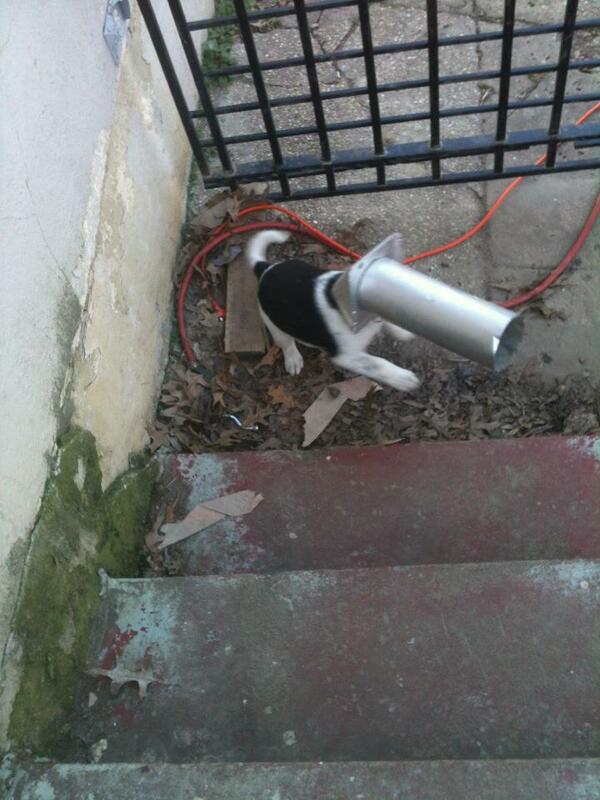 Never mind that killing shelter pets hasn’t solved anything anywhere ever. Because it’s easier not to do the research or the hard work of saving pets and simply blather on about animals running in the streets. A brilliant plan with no drawbacks. Unless you’re a shelter pet of course. “If people really care about the animals, the same people can still pull the animals as long as they are affiliated with a 501(c)3,” he said. Got that rescuers? If you really care about the animals, you will come up with $1000, get a lawyer and invest the time needed to acquire federal non-profit status. If you don’t have the money, or the lawyer or the time – apparently you don’t really care about the animals. Unlike say, Joel Hinson, I guess. Animal control has also stopped letting rescue groups take photos of the animals in the shelter because, Hinson said, some groups would post the photos with inaccurate information about when the dog or cat would be euthanized. The photos would create uproar on Facebook and prompt dozens of calls to animal control begging them not to kill the dog or cat, Hinson said. Yeah, I bet that’s annoying. Callers begging to save the lives of pets and they might even have the kill date wrong! Sounds too much like work. The solution is of course to bar all rescuers from photographing animals at the pound. Then no one will post any erroneous information on Facebook ever. And surely the staff at the pound has nothing else to do besides getting good quality photos of the animals and promptly posting them online with accurate info. The biggest help preventing the spread of diseases, he added, would be a larger shelter that allowed officials to separate puppies from dogs and keep the animals away from people during the quarantine period. Keep the animals away from those filthy, parvo-carrying people. Dang, I hate people. Especially the kind that complain about pet killing with the wrong dates in mind and the ones who have no 501(c)3 for their rescue group. They don’t really care about the animals. 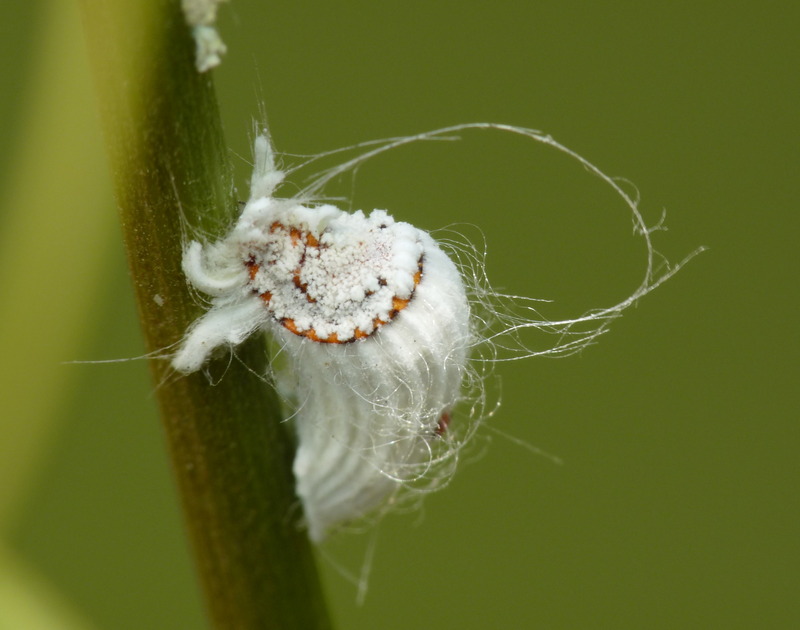 They just want to come in and touch them with their grubby little hands and take their pictures to post online. It’s gross. When sheriff’s deputies raided the Memphis Animal Shelter in 2009 and found dogs starved to death, the director, veterinarian and a supervisor were all charged with animal cruelty. The veterinarian, Angela Middleton, was the first to be tried. She had been charged with aggravated animal cruelty and last night, a jury acquitted her on all 6 counts. [T]he animals were supposed to have been fed twice a day [but workers] were instructed by [director Ernie] Alexander to feed only once a day, Dunlap said when questioned by prosecutor Chris West. MAS volunteer Jeanne Chancellor told the court Middleton was aware of the food shortage that summer of 2009 and advised volunteers on how to lure the alpha dogs to the front of the cages so canned foods could be tossed to the less dominant dogs at the back of the kennels. Chancellor said the shelter was low on everything, including toilet paper, and that Middleton had even asked the volunteers for help with medical supplies. In an interview with investigators, recorded on the day of the raid in 2009, Angela Middleton said she had reported her concerns about worsening conditions at MAS and specifically about the poor quality of the food, to the director and supervisor (both of whom await trial on animal cruelty charges). [S]helter volunteer Eleanor Gipson testified that the shelter and clinic were “at a complete standstill” in the summer of 2009 due to the lack of food and supplies. She said she e-mailed city public services director Moody about the shortages. A defense witness, Gipson said Middleton tried to help increase the food for the skinnier animals by giving the volunteers cards to post on the cages that said that they needed extra feedings. It took the jury just 4 hours to acquit Angela Middleton. What remains unclear to me is how shelter staff and volunteers who saw dogs starving right in front of them and who were feeding them insufficient quality and/or quantities of food to keep them alive were never charged and in fact, continue to care for pets at MAS. Perhaps this is part of the reason why dogs are still apparently starving at MAS in 2012. The risk of possible animal abuse by a screened adoption applicant exists at all times, not just Halloween. There is no evidence showing the risk of possible animal abuse by a screened adoption applicant increases at Halloween. And yet some shelters and rescue groups “protect” black cats by refusing to place them with screened applicants in the weeks leading up to Halloween. This myth-based practice results in increased cats in the kill room – which is the opposite of “protection”. While I don’t know if Memphis Animal Services refuses to adopt out black cats at Halloween, I do know they kill them, just like they do all year. And here, MAS reminds us that the real threat to black cats comes from those with the license to kill, not from mythical animal sacrifice ritualists at Halloween. 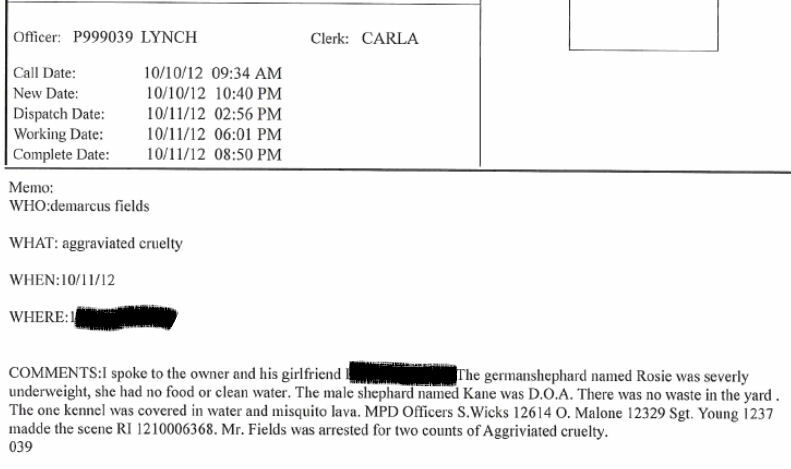 Portion of records, obtained via FOIA request, for kitten #247391 at the Memphis pound. 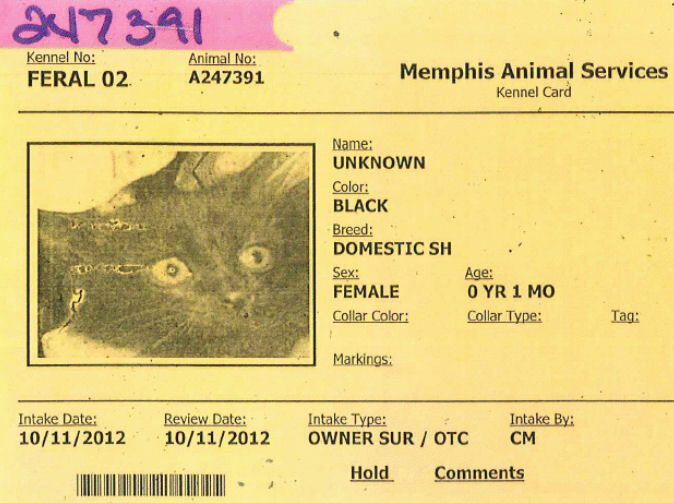 Portion of records, obtained via FOIA request, for kitten #247392 at the Memphis pound. This pair of black kittens could not have weighed more than 2 pounds combined. They were just one month old when someone brought them to MAS on October 11. 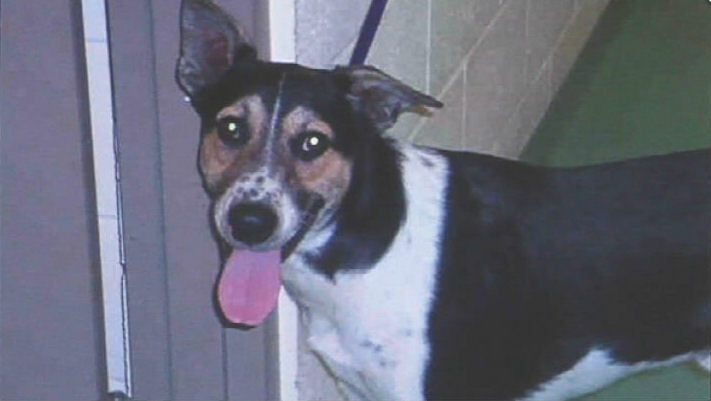 James Rogers, the interim director at the pound, allowed them to live overnight before deciding they were taking up too much room and had to die. Each kitten was killed, using enough Fatal Plus to kill a 10 pound dog, on October 12. It must have been difficult to find a vein on these tiny scared kittens and I wonder if they were in fact injected IC or IP instead. There was no sedative given according to the records. These healthy baby cats had a right to live. They were never offered for adoption and to my knowledge no plea was issued to rescue groups, fosters or the public before MAS killed them. How many more for your chamber of horrors, Memphis? Where there’s life, there’s hope. Where there’s MAS, there’s death. 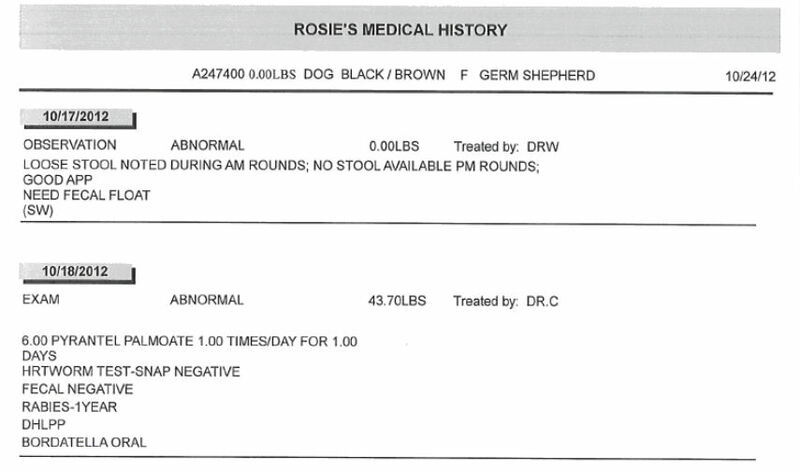 Portion of records, obtained via FOIA request, for Rosie at the Memphis pound (click to enlarge). On October 11, a dog owner in Memphis was charged with aggravated animal cruelty after an ACO responded to a complaint and found one dead dog and one emaciated dog without food or water. The emaciated dog, an adult German Shepherd Dog called Rosie, was impounded. She weighed just 39 pounds. The MAS vet completed a forensic exam on Rosie, vaccinated and dewormed her. Besides having been starved, Rosie appears to have been otherwise healthy. 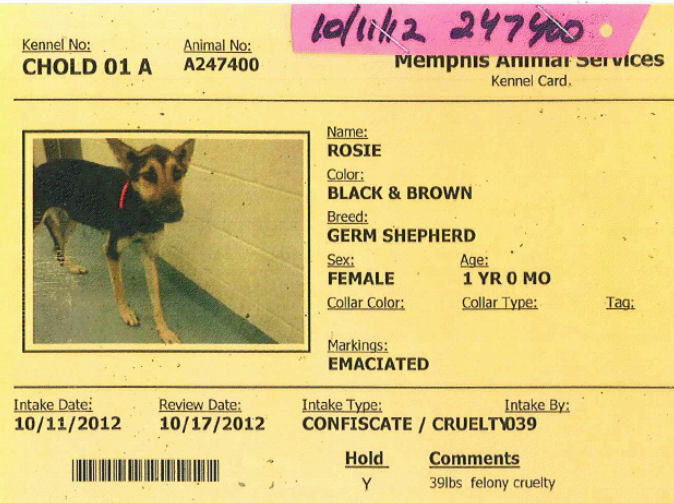 On October 23, Memphis Animal Services killed Rosie, despite having plenty of empty cages at the facility. 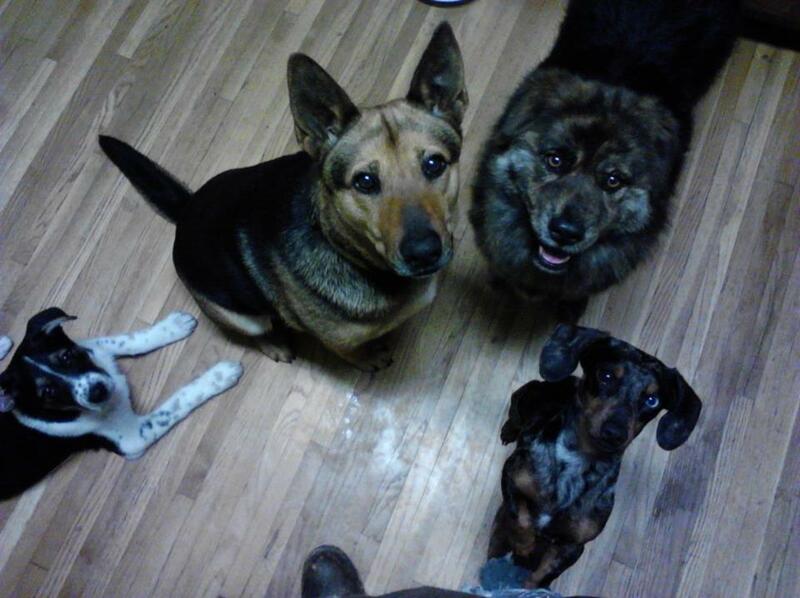 There are no notes indicating any GSD rescues – or any rescues at all – were contacted. To my knowledge, Rosie was never posted on Facebook or Petfinder nor was she housed in an area of the pound where adopters could meet her. Let me be clear: I do not approve of animal abuse in any form, including starvation. In this case, Rosie’s options were to remain in the care of someone who was severely neglecting her or go to a pound that would kill her. Neither of these options is acceptable. Rosie had a right to live. She deserved to be placed in an environment where that right would be respected. The bottom line is, the alleged animal abuser did what MAS failed to do – keep Rosie alive. And as repulsive as the thought may be, she might have been better off being left with the owner. Maybe she could have escaped and been picked up by a compassionate stranger. Maybe the owner would have gotten tired of her and given Rosie to someone who would have taken care of her. Maybe a friend or family member of the owner would have intervened and made sure Rosie was fed and loved. Where there’s life, there’s hope. Some will say that a “humane death” is better than a drawn-out death due to starvation. The problem with that line of thinking is two-fold: 1. We do not know for certain Rosie would have starved to death had she not been impounded by MAS. 2. Neither of these scenarios – humane death vs. agonizing death – takes into consideration Rosie’s right to live. It is a false choice. We are morally bound to offer Rosie, and every other pet, an option which includes respecting her inherent value and right to live. MAS refuses to consider that option. Therefore I would argue that tragically, MAS would better serve the community’s pets by leaving them in situations of neglect and hoping for the possibility of a good outcome. Because there will definitely be no good outcome if the animal goes to MAS. If anyone in Shelby Co is willing to take legal action on behalf of the pets at MAS, please let me know. You have my support. 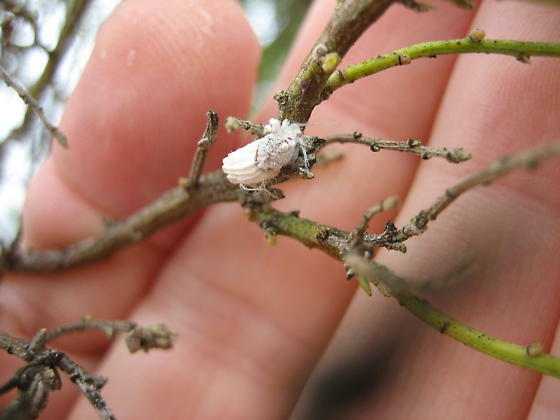 Scar, as shown on the KMPH website. 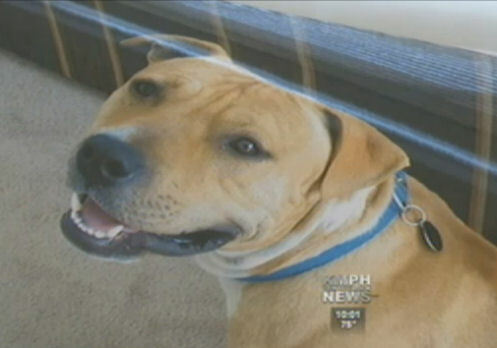 On September 24, the Del Rio family’s dog – a Pitbull called Scar – escaped the yard wearing his collar and ID tag. A Pitbull hating neighbor took the 11 month old puppy to the Central California SPCA and told them he’d been bitten by Scar. Owner Helen Del Rio went to the pound to get her dog back but instead she got one story after another from the staff: Scar bit the neighbor, he bit a cat, he killed a dog. Finally, they told her they’d investigate what really happened. Ms. Del Rio later received a letter from the pound apologizing – not for killing Scar – but for “our failure in insuring the return of your family pet to you.” The letter also promised more training for staff (where have we heard that before?) and a free pet (ditto). The Central CA SPCA would not respond to the TV station’s request for comment but people who left comments on the online article state that this is not an isolated incident at the pound. In 2011, the Humane Society of Carroll Co in MD killed 2457 of the 3053 cats who came through its doors. When Laura Shenk of the group Animal Advocates of Carroll Co MD noticed a cat adoption special on the pound’s website this month, she and her group set about promoting the $30 fee. The promotion appeared to be working since 18 cats were adopted in the first week which is more than twice the average number of cats adopted weekly at the facility. The adoption special was suddenly removed from the HS of Carroll Co’s website, without explanation, on October 8. In its place was a notice that cats could be adopted for a $50 fee which was later changed to a vague “please call for pricing” notice. Ms. Shenk contacted shelter director Nicky Ratliff to explain that her group had heavily promoted the $30 fee special and believed the shelter should honor the fee for the entire month, as originally advertised. On October 11, I sent an e-mail to Ms. Ratliff inquiring as to why the adoption fee special was discontinued. I have not received a response to that e-mail. I just asked my staff if anyone had called us to inquire about the $30.00 spayed and neutered cats/kittens or had anyone mentioned it when they came in to adopt and they said not a single person has called or said anything. For that reason we will not be once again changing our website for the remaining 11 days of the month that we are open to the public. So I guess that because nobody asked about a fee special the shelter removed from its website, there is no need to accept a $700 donation from a group of advocates trying to help the shelter reduce its horrifying 80% kill rate for cats. This makes sense to at least one person on this earth apparently. Unfortunately that person is killing most of the cats in her care and unwilling to accept free money from animal advocates to kill less. But nobody wants to kill pets, right? This is just for fun. The only rule is: No researching. Reading other people’s guesses before posting your own is optional. Answer will be posted in the comments later today.